vampires, monsters, witches, ghouls, goblins, gargoyles, zombies and horrors of all sorts! This week I bring you an horror short based on the movie "Halloween." It's called "He Came Home!" Return to Haddonfield in this tribute to the original 1978 horror classic, HALLOWEEN. I invite you to watch it in my New Blood Showcase! For the second and final week join me in a small Illinois town where a mysterious cone shaped ship has appeared. Visitors from another planet? No one knows, but they intend to find out where it's from and why locals are starting to act funny....deadly funny. Ed Nelson leads a cast that includes a mystery actor who would go on to galactic fame! I invite you to watch "The Brain Eaters" it in The Lab. The TombKeeper's kicking back with speculative fiction, one completely imaginary and one—gulp—based on events that could happen at any moment! The books are: ONE SECOND AFTER by William R. Forstchen and THE SEA THY MISTRESS by Elizabeth Bear! You'll find them in The Tomb! Mark J. Gross and Renee Grindlinger of Celebrity Biograph are back with another new contemporary celebrity interview! This week it's actor Peter Williams who has starred in "Stargate SG-1" and "Hero!" You'll find them in The Atrium! April 1, started a new month & I have 10 NEW Videos to watch on My FREE Roku Channel! 4 Classic Hosted Movies: "Lady Frankenstein," "Day of the Triffids" "Nightmare Castle," & "Man In The Attic!" 4 Classic Celebrity Interviews: The Voice of Bulma, Monica Rial, Puppeteer Bill Diamond, Film Maker Christopher Mihm & Horror Hostess, Stella Desire! 2 new outstanding horror shorts: "Schizophrenic" and "Cropped!" So, how can you add "Count Gore De Vol Presents to your Roku device? It is so easy! 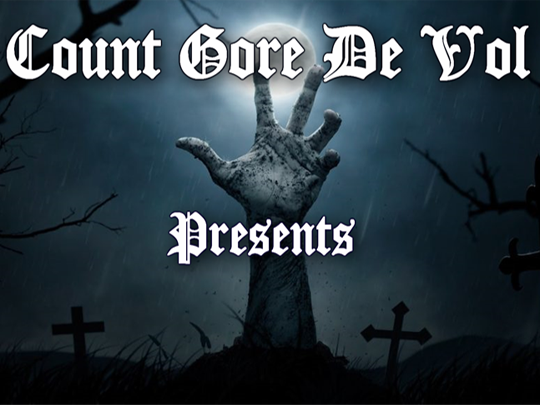 On your Roku go to "Streaming Channels" and look for under New Additions for Count Gore De Vol Presents! Go to the Roku "Streaming Channels" and then go to 'Search Channels." Select "Count Gore De Vol Presents" and click OK.
Then Select Add Channel, answer any questions and That's it! Looking to cut the cord and/or buy a new Internet Ready TV? Check out some helpful information in The Gallery! I'm hosting "Son Of Frankenstein" at The AFI Silver in less than 2 Weeks! Along with Guest Co-Host: Arch Campbell! Only 1 More Weeks to enter My SKULL BOWL Contest! The prize is a replica of a real MALE human skull cast in pure resin, from Zane Wylie Carved Skulls. The INSIDE of the bowl is coated with a food safe resin tested with liquid up to 205 degrees Fahrenheit . Each takes 5 days to create and is hand painted. The Retail value of this prize is $187! It's EASY to enter...there' no questions to answer. You only have to fill in the entry from, which you'll find in The Game Room! Dita Dirt Nap continues tickling her funny bone...but this time it's the help of Abbott and Costello! The movie is "Hold That Ghost!" I invite you to read her review in Dita's Den! Lady Pam De Graf reviews a film called, "The Resident!" The Story revolves around a young professional who moves into an unusual new apartment. Her life then takes a frightening turn for the worse. this film also stars Christopher Lee! She'll tell you all about it and let you watch the trailer just go to The Screaming Room! This week the Unimonster takes a thoughtful and historical look at a movie that I'll be hosting live at the AFI Silver Theatre on April 27. It's the classic, "Son of Frankenstein. His essay is called "Son of Frankenstein at 80: The Birth of the Universal “Horror Factory”!" You can read it in The Crypt! It's the last week for horror fans around the world to vote for their favorites in the biggest and most impressive fan based awards ever....The 2019 Rondo Awards!" There are more categories and nominees this year than films with Frankenstein in their title. You can find the ballot HERE! But PLEASE carefully read the instruction and don't forget to sign you ballot. For the record, This web program has been nominated in Category #20 (Best Multimedia Website) and Category #21, Favorite Horror Host! All entries must be in by April 20! The "Glow In The Dark" T-Shirt Autographed by Count Gore De Vol makes a COOL Holiday Present! Just go to The Market! There's also an Incredible Selection of movies hosted by...Me! 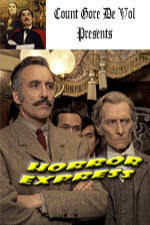 Christopher Lee, Peter Cushing and Telly Savalas are stuck on the Siberian Express with a soul sucking monster! Hosted by Count Gore De Vol! Only $13 includes shipping in US! 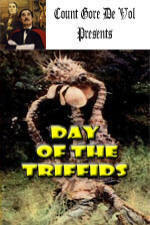 A brilliant global meteor shower blinds the population and drops spores fro man eating mobile plants! It stars Howard Keel and is hosted by Count Gore De Vol! A fun movie with James West and Count Gore gets a "Killer" App! You also can order an Autographed 8X10 picture in The Market! All Right. Some Cats Do Fetch! Mississippi neighbors perplexed by mashed potato mystery! Case That Began With 3 Naked Women At A Rest Stop Ends In High-Speed Chase In Florida! Thousands sign online petition to save 'Flintstone' house at centre of planning row! You'll find links to these and other strange things when you explore The Skullery! I am offering a daily Horrorscope for those who want to help determining the destiny of their lives! Check it EVERY Morning! ***Saturday, April 27, 2019 a the AFI Silver Theatre, I'll be LIVE HOSTING the 1939 Universal Classic, "Son Of Frankenstein!" This film stars, Basil Rathbone, Boris Karloff and Bela Lugosi and picks up 20 years after the original Dr. Frankenstein has died. This truly is one of the better films in the series. And to top things off, Media Critic Arch Campbell will be my co-host! Get your ticket NOW! Please subscribe to my NEW weekly newsletter! This is not more spam, just a short, weekly summary of new and exciting changes to this web program with links. This list is a private list and no information is distributed to anyone! Plus, you can unsubscribe at any time! Find Count Gore De Vol on the Web! Creature Feature the Weekly Web Program is brought to you with limited commercials. I you would like to support this effort WITHOUT any cost to you, please use out links to Amazon when ever you buy something from them online. Every time a you purchase from Amazon using a link from this site, you provide support for this venture....at NO COST TO YOU! Many Categories of Horror Related Websites! So, please visit my new and improved Links Page! A Horror Host Group for YOU! The "Fans of Horror Hosts!" list on Yahoo is celebrating it's 18th anniversary and I invite you to check it out. Not only do folks discuss their favorite horror hosts...past and present...but they manage to get into all things horror. It's moderated by The Bone Jangler. If you would like to join this group, you can easily register HERE! Of course you can also find some of my videos at Count Gore TV Just search for Count Gore or Creature Feature! Looking for something on the Web? Please use my custom Google Search! If you are looking for information about Captain 20, Bozo, Kids' Break or W.O.W.! Click Here! If you're new to the program and wonder who I am, please take a few moments and visit an award winning site designed by Gary Eckstein. It features a detailed history by the late Elena M. Watson. You get there by clicking here. The TombKeeper Reviews the book "7th Sigma!" A Culty DVD Review by Dita Dirt Nap! Mark & Renee interview Actor & Stuntman, Mark Dopud!